Across New York, people are demanding policy changes to improve the lives of undocumented immigrants. On Tuesday, March 19, that demand rang in Governor Cuomo’s halls from New York City to Albany. 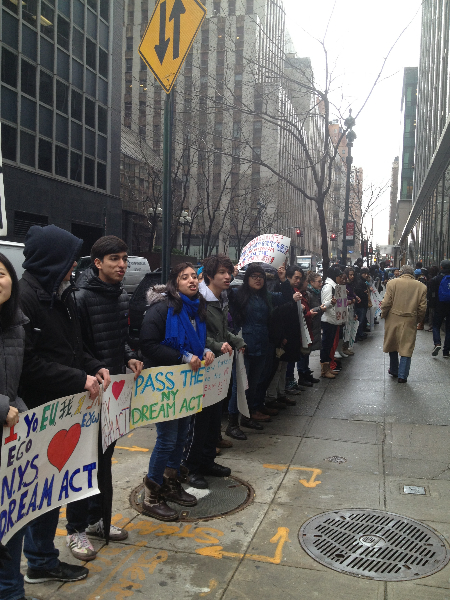 The New York State Youth Leadership Council (NYSYLC) gathered more than a hundred students, young people and allies to demand NY State pass the NY Dream Act, which would allow undocumented students access to the Tuition Assistance Program (TAP) for the first time. 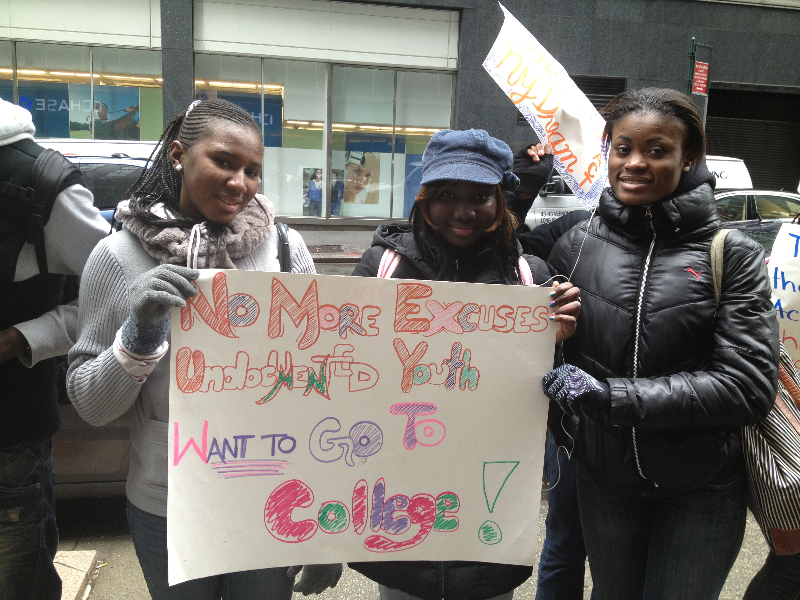 Currently, only 5-10% of undocumented youth make it to college (NYSYLC). There are an estimated 85,000 students who could stand to benefit from the instatement of the NY Dream Act now or in the near future (Immigration Policy Center). While I made my way to the human chain in New York City, my mind drifted to the thousands of undocumented detainees released from Federal detention centers in light of the coming sequester (LA Times). Their mass release serves to clarify the relation between the United States immigration policy and capitalism. The NYSYLC’s fight for the NY Dream Act does the same work because the bill’s purpose is to extend access to TAP, to capital, which otherwise serves as a barrier to entry in our universities, both public and private. The energy at the NYC human chain action serves as an inspiration to anyone losing faith in the youth movement. Young people, many in middle and high school, chanted loudly outside the governor’s New York City office, “Up, up with education! Down, down with Cuomo’s hesitation!” and “Undocumented and UnAfraid!” Each shout demanded the right to a life without fear, to a life with the freedom to pursue their dreams in constrained by the limits of citizenship. 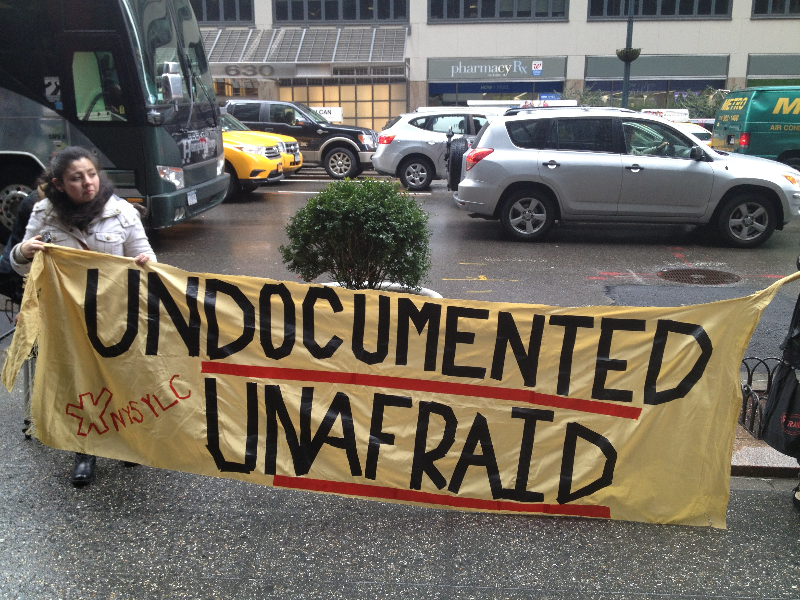 The NYSYLC is led almost entirely by undocumented or previously undocumented young people who bravely choose to organize despite the potential for detainment and deportation. These young people are building a movement, they’ve built one. 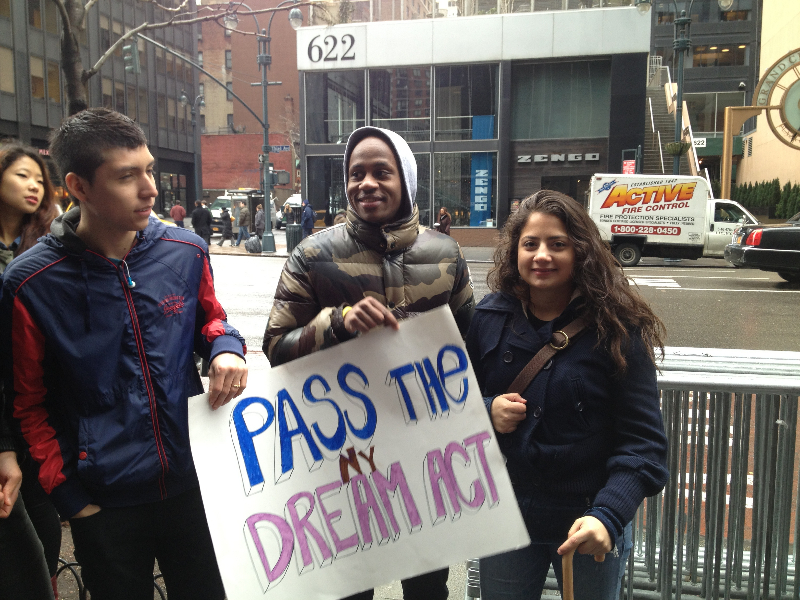 The NYSYLC wants the NY Dream Act because they recognize its importance. However, they continue to ask the question, “What about our parents?” They want comprehensive reforms that create opportunities not only for the “good” undocumented immigrants who are easily palatable in the mainstream. Their work rests on the principle that both education and dignity are human rights for all people. As I looked into the bright and angry faces of the many young women and men forming the human chain around the governor’s office, fearlessly chanting for the right to a better life, I started to feel hopeful, to see this messy, painful time of austerity and inadequate proposals for immigration reform as a flashpoint for a movement that is working to liberate undocumented immigrants. As a feminist who thinks about the gendered quality of work and access to education, both globally and at home, I think it must be among our top priorities to extend and increase access to universities and technical training institutions for everyone. Getting involved in the struggle for the rights of undocumented immigrants gives us a chance to envision a world with equitable opportunities for people who don’t fit neatly into a culture consumed with arbitrary borders as their geopolitical fault lines. This entry was posted in Immigration, Uncategorized and tagged activism, angelica clarke, immigration, new york state leadership council, NY Dream Act, nyc human chain, protest, she breathes, tuition assistance program, undocumented immigrants. Bookmark the permalink.